See also on the bottom of this page. 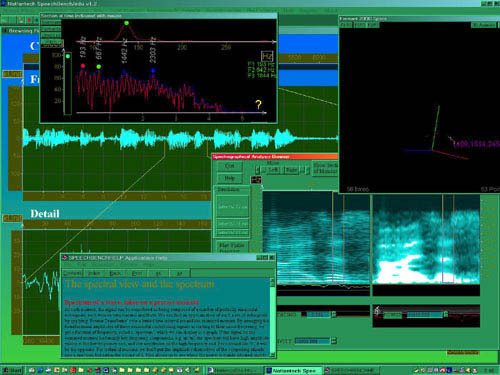 Software Package to learn about the nature of speech and examine specific aspects and details of live or recorded speech fragments. Although it can be useful for professionals in for instance speech recognition, phonology and speech therapy, it is specifically intended toward students in these and other fields: The visualisation/animation of otherways difficult to grasp items like formants and pitch, allow fast understanding. And in the Help system, you can find a lot of theoretical background, as well as everything you need to know to learn to handle the program itself. Live viewing of a wave (from a microphone, or another input device) plus its spectrogram, optionally while recording to file. Easy and intuitive browsing in an off-line wave, with three levels of viewing and playback: file / fragment / detail. 3D animation for viewing the 3 main formants as a point in 3D formant space, or 2D graphs for any 2 formant combination. (again, moment indicated by mouse or automatically moved). 3D animation for viewing an example of phonetic populations (very instructive to understand how phoneme recognition works to a large extent). Semi-automatic recording of a list of words, for instance to easily record a lexicon. Instructive Help, including theoretical background. PC compatible computer (CPU clock speed >=100 MHz). Installation needs at least 16 MB hard disk space. CDROM-drive (for the CD versions, it is required to install the program). a standard Soundcard, a set of speakers, a good microphone. a 2-button mouse (scroll wheel recommended). Downloadable, Operational for 4 weeks. You get your definitive code from us within that period. If you want to receive the Full version on CDROM, this is also possible, but you will have to pay $26 extra for CDROM-media and shipping. When you click on any of the previous downloads, choose Save. Save to an empty new directory. What you receive is a self extracting file. When, after downloading is finished, you open it in the Explorer, it will ask you where the extracted files should be put. Put them in the same temporary directory like for instance c:\InstalSpeechBenchEdu\ . After this is done, click on Setup (one of the extracted files) to begin installation. After installation, you can, if you wish, remove the downloaded file itself, and the temporary directory. If you can't remember this, print this page out, or keep your internet browser on this page (which is not a good idea, as installation might require that as few as possible programs are running at the same time). By the way, the download and installation steps are pretty much according to the usual procedure.